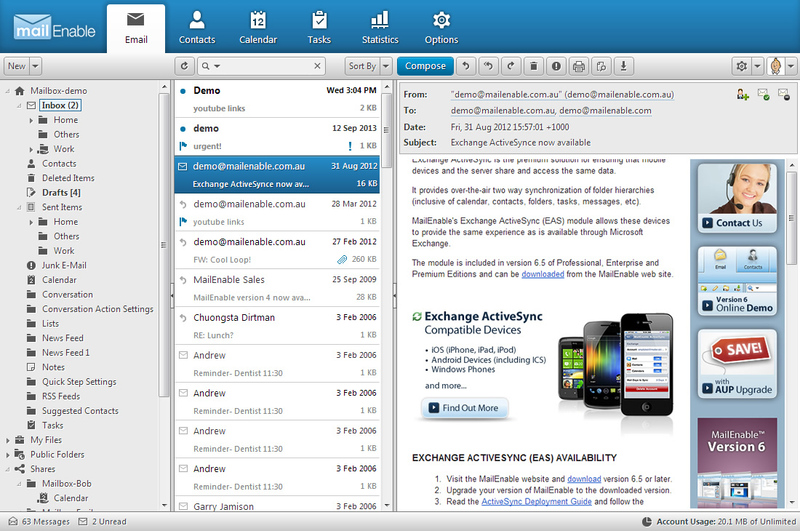 MailEnable Version 5 includes a new webmail client which has been freshly laid out and styled with a totally new appearance, designed for a pleasant experience. 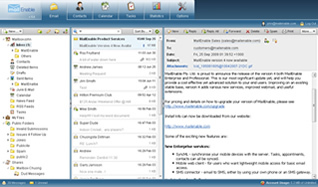 The webmail client has been optimized for improved speed and responsiveness. It utilizes page caching and requires fewer page accesses to the server. Web client graphics are cached into resource files to reduce the amount of time for the web client to load. You will spend less time waiting in Version 5! 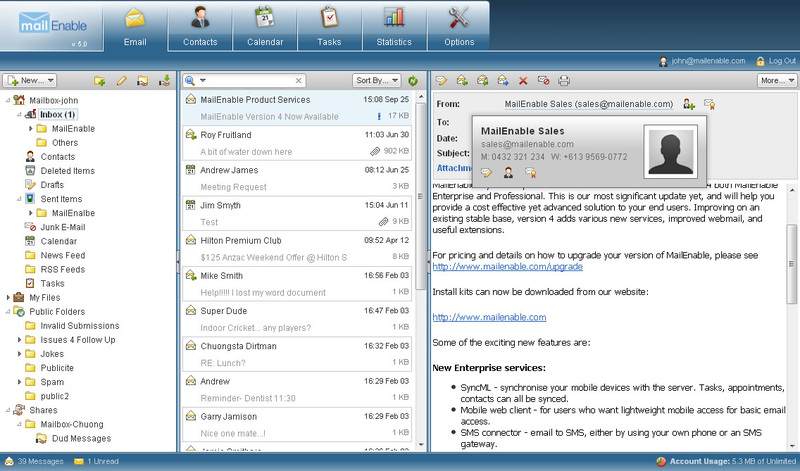 The new webmail client is also device-aware, and will optimize its interface to better suit the client browser. The webmail application attempts to detect touch-screen clients (like the Apple iPhone and iPad) and will adapt the interface to save resolution and change its scroll behaviour. Version 5 also includes a new version of Web Administration, with a style and layout that is consistent with the new webmail interface. 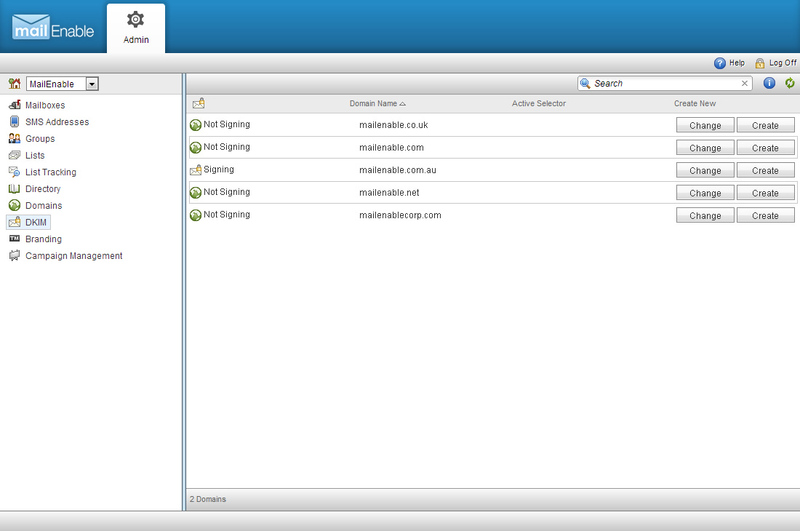 Enterprise and Premium Edition customers can now manage SMS addresses via the Web Administration console. Previous versions of MailEnable only applied mailbox whitelists as messages were being delivered to the mailbox. MailEnable Version 5 allows whitelisting to occur as messages arrive via SMTP. This prevents messages from these domains from being delayed by greylisting. This feature can be enabled or disabled as required. 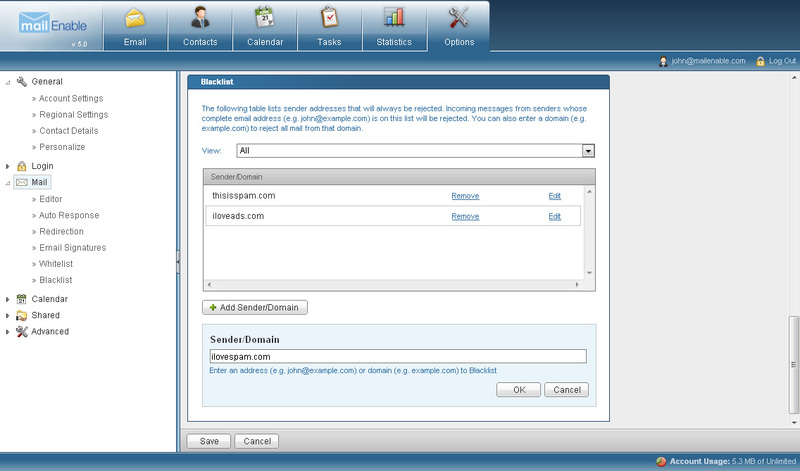 Similarly, Version 5 also allows end users to reject messages from a given domain or user at the SMTP level. 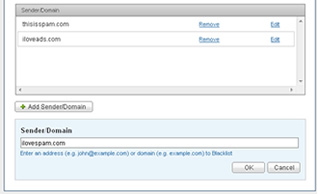 A list of blacklisted email addresses and domains can be configured via the webmail client. When a blacklisted sender attempts to send the message, the SMTP connector will immediately refuse the delivery attempt. Users are now able to review their mailbox activity via detailed report and activity graphs. These are available within the webmail interface, and provide feedback to users in an attractive format. 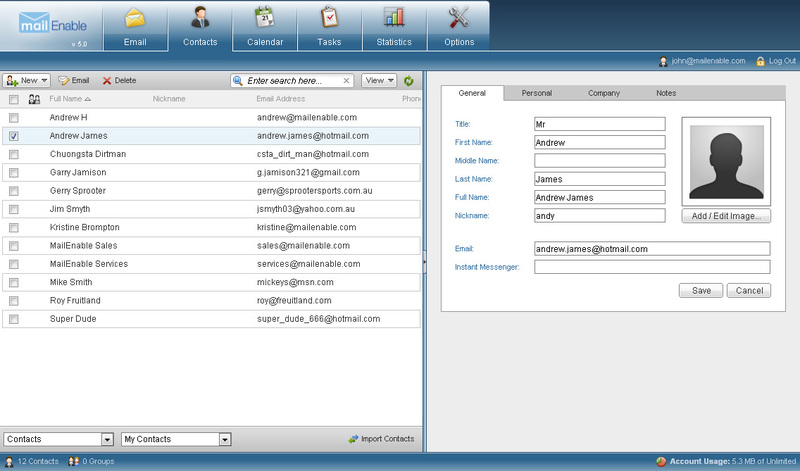 With this new feature, webmail users can visually analyze their email input and output. The monitoring tools provided with Version 5 have been extended to allow you to easily review the status of the messaging subsystem. You can access the system overview console and can review which accounts are generating the most activity. This allows administrators to identify any accounts that are being abused and to take an appropriate action. New in Version 5 is the ability to add a photo to contacts. The new webmail client contains support for contact photos, as does the MAPI connector, CardDAV and SyncML services. Photos can also be associated with entries in the global directory, and users are able to update their directory image, along with their contact details, in the options within webmail. This powerful addition provides a simple and hassle free method for MailEnable end users to publish images, presentations or documents to the greater community. New in Version 5 is the ability in webmail to have an inline contact card appear (overlayed) when the mouse cursor is held hovering above the address field in the message header section of the preview pane. This inline contact card will provide webmail users with a quick snapshot of the contact details for the sender, if they have already been added to the Address Book. If the contact does not exist then it will facilitate a means to quickly add it. The inline contact card also provides other action buttons to allow for quick interaction with the contact, such as compose a new email for it, view its full details from the Contacts list, or add it to the whitelist. Version 5 now has a completely redesigned and much improved File Viewer user interface that provides users with a richer / enhanced experience when previewing files (in particular images) that have been published via MailEnable webmail. Now you will be able to do more than just preview an image! Users will now be able to zoom in/out of an image, automatically resize it to fit the current window size, reset it to its original size (100%), and set the background color for a better contrasting viewing effect. MailEnable's recent implementation of Upgrade Protection also means that a greater number of MailEnable customers can upgrade to Version 5 for free. Anyone who is under Annual Upgrade Protection (AUP) will be able to upgrade to Version 5 at no additional cost. Users whose upgrade protection has expired will be able to renew their upgrade protection and can then upgrade at no additional cost. 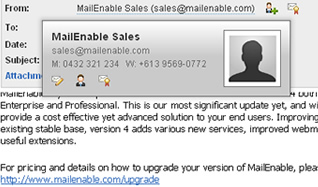 Prior to Version 5, MailEnable required running a processor to generate language specific pages for its webmail client. This made it difficult to author new languages or change language tokens as changes needed to be applied by running a utility to create a language specific branch. As a result of simplifying the tokenization, new languages can be added by simply editing a text file in the MailEnable Bin directory. The Version 5 webmail client also adjusts itself to support Right-To-Left languages, such as Hebrew and Arabic. Some significant improvements have been made in the way that MailEnable accommodates timezone and daylight saving changes. Apple iPhone appointments (which use floating time) are now rendered correctly in webmail. Improvements have also been made to ensure that appointments created on mobile devices are correctly represented in other MailEnable clients. System Administrators can now configure global thresholds for message throughput. Administrators can save server-wide settings that limit the number of messages sent by a user. These settings can be overridden as required on a per postoffice or mailbox basis. By default, users are capped at 100 messages per hour. 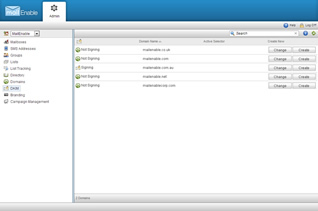 As well as supporting an impressive array of third party plug-in scanners, MailEnable now includes a pre-configured installation of ClamAV. Premium, Enterprise and Professional Edition customers will now be able to have virus scanning enabled and activated as a selectable component of the MailEnable installation. Microsoft Outlook and Exchange are registered trademarks of Microsoft Corporation. MailEnable is a registered trademark of MailEnable Pty. Ltd. Apple iPhone and iPad are registered trademarks of Apple Inc.